To Hermod on the "Ships starting with H" page. Here's a message from her in my Guestbook. This one was received from Aud Steier Griem, another daughter of the captain. She has a message on one of my forums, in which she says she'd like to get in touch with crew members or their descendants. Built in Danzig, Germany in 1925. Captain Eilif Steier, who had previously served on Paris, Hermion, Hamlet, Haab, Hellen, Hamlet again, then Credo (ex Hamlet, listed under Credo on this site) and Hai Hing, all pre war and in misc. positions. From July-1938 to Sept.-1940 he was 2nd mate on Hermod, then 1st mate until Nov.-1940, before becoming 2nd mate again until Jan.-1941 at which time he again became the 1st mate until March 27-1942, so it looks like he became the captain just a few days before she was sunk. 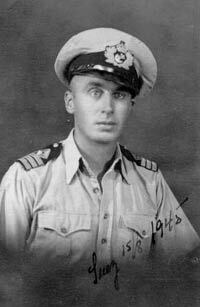 That summer he joined Graciosa as 1st mate until Nov.-1942, Lyder Sagen as 1st mate in 1944, and subsequently served as 2. mate, 1st mate and captain of Mosli in the period Febr.-1945 until the summer of 1950. After that he only served on various Mos- ships (as captain) up until his death on board Moscliff in Oct.-1965 off Japan. As will be seen when going to Page 1 above, Hermod was in Singapore when war broke out in Norway on Apr. 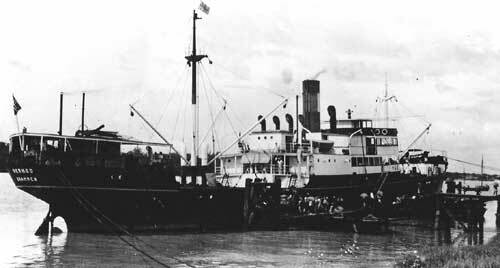 9-1940, having arrived there from Bangkok the day before. Hermod departed Calcutta on Apr. 2-1942 for Colombo with general cargo. In the late afternoon of Apr. 3 she joined up with the British Dardanus and the American Point Clear as instructed by Naval Control in Calcutta, but in the evening of Apr. 4, Hermod left the other ships and continued along the coast alone. At 04:14 GMT on Apr. 6 she was fired upon by what is assmued to have been the same Japanese war ships that had just sunk M/S Dagfred that day (M/T Elsa was also sunk in the area on April 6). Her engines were stopped and shortly afterwards they saw the attacker about 5-6 n. miles off to port, but were not able to identify the vessel. The ship fired again, hitting Hermod in several places. The 6 Norwegian officers and crew of 30 Chinese had escaped unharmed in 3 lifeboats and rowed away from the ship as quickly as they could. When they were about 150 meters away, about 8 minutes after the intitial attack, Hermod went down, whereupon the attacker disappeared. At that time 2 aircraft circled above the area, but the men in the lifeboats were not fired upon. They set sail for the coast which was about 10 n. miles away and landed at 10:00 GMT that morning near the village Atraveda (Antervedi?) on the coast of Godavari (Madras Presidency), where they were well taken care of by the locals before being sent on to Calcutta by train, with arrival on Apr. 9. The maritime hearings were held there on Apr. 13-1942 with the captain, the 1st engineer and the 1st mate appearing. 1st Mate Einar Corneliussen, 2nd Mate Johannes Andreassen*, 1st Engineer Alvinius Alviniussen, 2nd Engineer Ole Olsen, and 3rd Engineer Johan Føske. *Johannes Andreassen had previously served as boatswain on Ole Jacob when that ship was captured in Nov.-1940, subsequently joining Mabella as 2nd mate in Dec.-1940. Following the loss of Mabella, he joined Hermod as 2nd mate on Apr. 2-1942, in other words, just a few days before she was sunk. He then joined Nyco as 2nd mate from May-1942 until June-1942, and 1st mate from Sept.-1942 until Nov. 19-1942, when he took over as captain, remaining as such until Febr. 11-1943 - follow links for more details. (Source: E-mail from Helge Christoffersen, Norway - his source: National Archives of Norway). Japanese Navy Ships - Pictures (includes submarines). Back to Hermod on the "Ships starting with H" page. Other ships by this name: The name Hermod has been used a few times for Norwegian ships of varying sizes through the years. In 1889 a small Hermod (469 gt) was delivered to Johan Chr. Giertsen, Bergen - lost following a collision in Aug.-1898. The same company had another, larger Hermod delivered in Nov.-1900, 1144 gt. This ship ran aground in Apr.-1916, when on a voyage Swansea-Rouen. Norway also had a Hermod in the 1980's, originally delivered as Garbeta to owners in London in 1975, built in Moss, Norway, 15 480 gt. Renamed Hermod in 1987 (Helge R. Myhre A/S, Oslo). 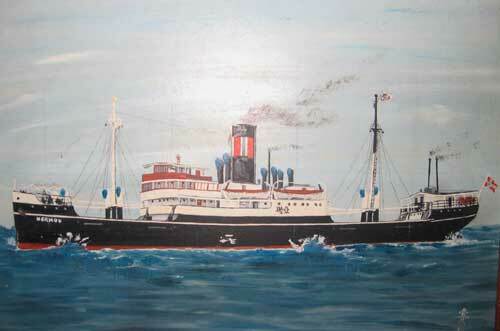 Had various Norwegian managers until 1996 when she was sold to India and renamed Maharshi Vyas. The text on this page was compiled with the help of: "Nortraships flåte", J. R. Hegland, "Sjøforklaringer fra 2. verdenskrig", Vol. I - (ref. My sources).